The French Ambassador to Ghana, H.E. Francois Pujolas, has praised the Department of French Education, University of Education, Winneba, for the passion with which they participated in an exhibition mounted by Presence Africaine. He was particularly impressed by a paper that Dr Alfred B Cudjoe, Head of Department of French, presented on the language of African literature, a subject which, in the Ambassador’s words, has generated a lot of debate. 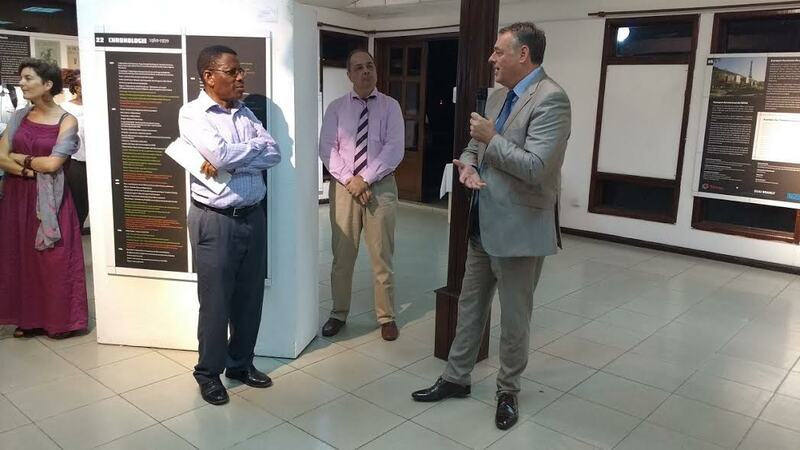 Ambassador Pujolas was launching an exhibition by Presence Africaine, a Francophone publishing company and a literary movement, at Alliance Francaise in Accra. He also hailed the crucial role that the first president of Ghana, Osagyefo Dr Kwame Nkrumah, played in promoting Pan-Africanist publishing houses like Presence Africaine. “This exhibition is a record of historical events of the Presence Africaine movement and their importance to Ghana as it prepares for its 60th independence anniversary celebration and the important role played by Osagyefo Dr Kwame Nkrumah, a founding father of Pan-Africanism,” said Ambassador Pujolas. As part of the programmes lined up for the exhibition Dr Alfred B Cudjoe, Head of French Department, University of Education, Winneba, presented a paper on Francophone African literature. Recalling the origin and objectives of modern African literature, Dr Cudjoe asserted that while African politicians in the 1950s were fighting for political and economic independence their intellectual counterparts were trying to ensure that their people became culturally and intellectually liberated. Thus pioneering literary works like those of Ferdinand Oyono of Cameroon, Chinua Achebe of Nigeria and Sedar Senghor of Senegal sort to portray the exact image of Africa. The contradiction of producing African literature in colonial languages like English, French, Spanish and Portuguese, according to Dr Cudjoe, was a dilemma that the early writers had to deal with. The question was how would they successfully use the language of colonisation and oppression to express African culture, especially since by their nature, European languages could not easily express indigenous African ideas. Quoting literary experts like Chinua Achebe and Amadou Konde, Dr Cudjoe explained how African intellectuals overcame this dilemma. Since one does throw the child away with the dirty water, according to Achebe, the African has to overlook the negative aspects of colonialism and focus on the few advantages that the white man’s rule has left behind. One of the advantages is the inheritance of powerful European languages through which Africans can reach the world, including Europe, in propagating the African message that the Blackman also has a culture and a civilization. To rid the European languages of their colonial and hegemonic tendencies the African writer, according to Dr Cudjoe, resorts to innovative strategies like Africanisation, nativisation, domestication and decolonisation to make the European language of literary production carry the African message. Earlier on, in his introductory speech welcoming participants to the exhibition, Monsieur Frederic Dart, Director of Alliance Francaise in Accra, said his centre was happy to host such an exhibition because of its importance in the production literature. He was grateful to Institut Francais and TOTAL Ghana for sponsoring the event. Present at the ceremony were members of the diplomatic corps, including HE Heather Cameron, High Commissioner of Canada, Mr Francois Schmidt, Deputy Head of Mission, Swiss Ambassy, Dr Jean-Luc Mure, Cooperation and Cultural Affairs Counsellor of French Embassy and Director, Institut Francais, high level representation from the embassies of Mali, Republic of Guinea, Cote d’Ivoire, Benin and Niger. 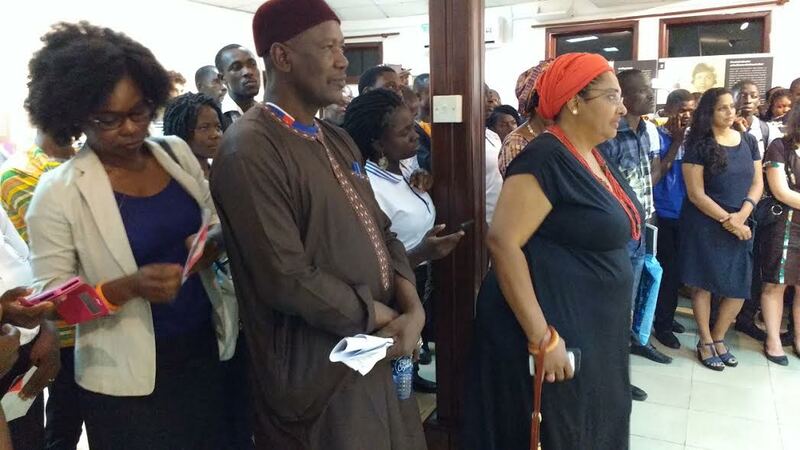 There were also lecturers and students from the departments of French from some universities, especially University of Education, Winneba, University of Ghana, Legon and Ashesi University. The company Total Ghana was represented by Mr Bright Dokosi, Director of Human Resources.